Hi! I'm Mallory. I was born into a family of musician and began studying piano at age 4. Along the way, I've also studied cello and voice, and I've performed with many different ensembles and band. I opened my mobile studio in the Pasadena, CA are in 2012. I have a passion for teaching preschoolers, pop, show tunes, and composing. When I'm not teaching you will probably find me in the kitchen. I spend A LOT of time in the car. While my students don't live particularly far from me, I live in Los Angeles, and traffic is ubiquitous. Over the last couple of years, the one thing that has made all that driving more bearable is podcasts. I love to keep a mix of genres in my app: news, business, professional development, inspiring, entertaining, and just plain fun! Below I have compiled a list of some of my favorites, sorted by category. I once heard Carol Matz say in an interview that she tries to avoid "ice cream songs." Ice cream songs are those pop songs that are popular for 5 minutes, but by the time you arrange them for piano students, they've lost their appeal. 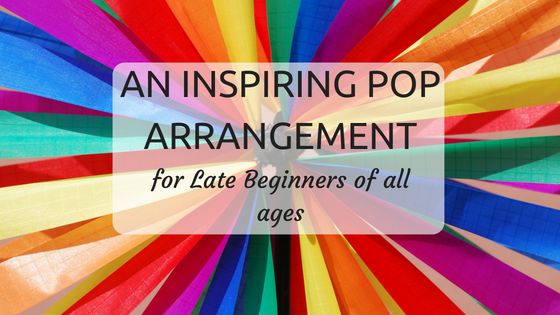 Today's featured arrangement is definitely not an ice cream song, and what's even better, it will appeal to students of all ages! Hi! I'm Mallory. 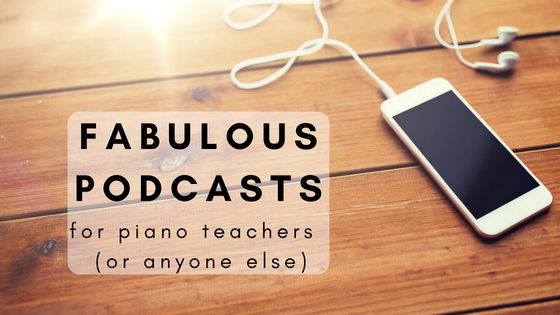 I run a mobile piano studio in Southern California, and these are some of my musings. I'm sharing the things I love. I hope you like them too!